Carotid artery stenosis caused by carotid artery atherosclerosis is the main cause of stroke and causes high morbidity and mortality. At present, carotid arterial endarterectomy (CAE) surgeries have been accepted as the most effective method to prevent stroke and transient ischemic attack in cases of symptomatic or asymptomatic carotid artery stenosis. However, the most important complication of CAE operations is cerebral embolism or hypoperfusion after intraoperative carotid artery clamp common carotid (CC), which is reported to be seen in 2%–3% of cases. For this reason, early detection of embolism or cerebral hypoperfusion, which may occur during the course of CC, has critical importance in preventing potential neurological damage and more serious cerebral damage. For this purpose, various cerebral monitoring methods are used in CAE surgery, for example, electroencephalogram, somatosensory evoked potentials, transcranial Doppler (TCD) in which cerebral blood flow is directly evaluated, jugular venous oxygen saturation (SpO2) which gives information about cerebral oxygen metabolism, and regional cerebral perfusion oximetry (NIRS). Near infrared spectrometry (NIRS) measures regional oxygenation (oxyhemoglobin/total hemoglobin) by interpreting oxy- and deoxyhemoglobin signals. Normal NIRS values are around 60%. Decreased brain perfusion during the intraoperative carotid artery CC leads to a decline in NIRS value. To prevent this, intraluminal shunt is placed to preserve brain perfusion. In this study, retrospective analysis of data on the efficacy of cerebral oximetry (NIRS) in the decision of shunt use during elective CAE surveys was planned. Following the approval of the local ethics committee (13/13.03/2018), the medical records of patients who underwent elective CAE between December 1, 2016, and December 15, 2017, were examined. Patients were evaluated for demographic data, NIRS values, blood pressure arterial values, shunt use, and the presence of postoperative neurological problems. In all patients taken in the room, electrocardiography, peripheral SpO2, and noninvasive blood pressure and invasive arterial pressure monitoring were applied and 18G peripheral intravenous cannula was placed and 0.9% normal saline infusion was started. None of the patients were premedicated before surgery. NIRS probe was placed in all patients before anesthesia, and initial value was recorded and was monitored throughout the entire procedure and until the patient was taken from the operating table (INVOS 5100 Cerebral Oximeter, Somanetics Corporation). All cases were operated under general anesthesia in the standard CAE surgical position (face is looking in the opposite direction in supine position). Induction of anesthesia was achieved with thiopental (5 mg/kg, IE Ulagay), rocuronium (0.5 mg/kg, Merck Sharp and Dohme), and remifentanil (1 μg/kg, GlaxoSmithKline). Mean arterial pressure (MAP) was measured invasively using a 20-gauge catheter placed in the radial artery. The mechanical ventilation parameters were adjusted to be within the limits of end-tidal carbon dioxide normocarbia (35–40 mmHg). Anesthesia was maintained with sevoflurane (1.5%–2%) and remifentanil (0.05–0.1 μg/kg/min). To prevent the development of bradycardia, 1% lidocaine was applied by the surgical team on internal, external, and CC arteries. Following systemic intravenous (5000 IU) heparin administration, the carotid arterial cross-clamp was placed at the appropriate active clotting time >200. After cross-clamping, “stump pressure” was measured. The cutoff value for intraluminal shunt placement was accepted as 10% reduction (10% reduction from the previous value after cross-clamping) for NIRS and 40 mmHg for stump pressure. 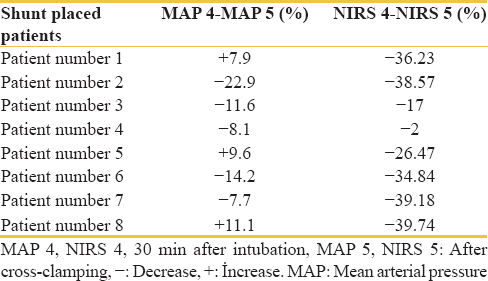 The NIRS and MAP values of the patients were evaluated at awake (1), after induction (2), after intubation (3), 30 min after intubation (4), after cross-clamping (5), 5 min after cross-clamping (6), 10 min after cross-clamping (7), 20 min after cross-clamping (8), and at the postextubation period (9). The Statistical Package for the Social Sciences 21.0 (SPSS Inc, Chicago, Illinois, USA) was used in the analysis of the data. Mean and standard deviation were used for descriptive statistical methods when study data were evaluated. In the comparison of quantitative data, Mann–Whitney U-test was used for the comparison of the parameters between the groups, and Wilcoxon signed-rank test was used for the intragroup comparison of the parameters. The results were evaluated at a 95% confidence interval and a statistically significance level of P < 0.05. The records of 68 patients who underwent elective CAE were reviewed. Of the patients, 20 were female and 48 were male. The mean age was 70.4 ± 8.48 years. The duration of cross-clamping applied to the patient was 29.14 ± 9.64 min. Intraluminal shunt was placed in 8 (11.7%) patients. The right side of 33 patients and the left side of 35 patients were operated. In patients with shunt, 4 of them were right and 4 of them were left side [Table 1]. [Table 2] shows the NIRS values of patients who have shunts placed and not. 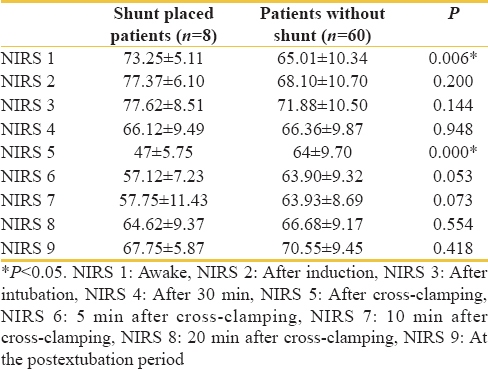 NIRS value at the time when patients were awake (P = 0.006) and NIRS value after cross-clamping was lower (P = 0.000) in patients with shunt. [Table 3] shows the NIRS values and stump pressures of the 8 patients who underwent shunt placement after cross-clamping. It is seen that all values are below 40 mmHg. The relationship between MAP and NIRS values before and after cross-clamping is given in [Table 4]. Both MAP and NIRS values of 2, 3, and 7 patients were found to be decreased, whereas in 1, 5, and 8 patients of MAP increased and NIRS decreased. Despite the fact that there is no change in NIRS value in patient number 4, a decrease of 8.1% in MAP value was noted. There was no statistical correlation between MAP and NIRS values. Only one patient developed postoperative right hemiparesis. No complications were found in other patients. The CAE-related strokes occur due to cerebral embolism, hypoperfusion, or thrombosis. One of the measures that can be taken to avoid this is to place the intraluminal shunt to prevent the cerebral blood circulation from being interrupted. However, the routine use of shunt placement is not recommended due to the potential risks (arterial dissection, air embolism, and thrombosis). Intraoperative cerebral monitoring is required to avoid neurological complications and to prevent unnecessary shunt placement in patients undergoing general anesthesia CAE. Many different techniques are used for this purpose. In this study, we evaluated the effect of intraoperative NIRS value and stump pressure measurement on shunt placement decision in patients undergoing CAE under general anesthesia; we found that shunts were used in 8 (11.7%) of 68 patients. In these 8 patients, we observed that the NIRS values of patients after cross-clamping were decreased. This decrease was statistically significant when compared to patients who did not placed shunt (P = 0.000). The decrease in NIRS values of these eight patients was >10% except one patient. When the stump pressures of the patients were measured in the same period, it was seen that the values of patients who placed shunt were lower than patients who did not placed shunt. Seven patients who placed shunt were found to have a decline of >10% in NIRS values and a fall of 40 mmHg in stump pressures. In one patient (patient number 4), however, the intraluminal shunt placement was decided because the stump pressure was 22 mmHg although the fall in NIRS value was minimal. There is no clear consensus on ideal cerebral monitoring in CAE operations under general anesthesia. Therefore, it is stated that it is better to use more than one method together. We also decided to place a shunt in one of our patients for the reason that the stump pressure measurement was low when the NIRS value did not change. Jonsson et al. compared stump pressures and NIRS measurements in CAE operations in terms of shunt placement, and as a result they reported that NIRS measurement was more accurate than stump pressure measurements. In a previous study comparing TCD and NIRS monitorizations, NIRS monitoring was found to be more effective in detecting the necessity of shunt use, and it was stated that it is easier to use. However, some authors suggest that the NIRS values may be affected by some factors. These factors include arterial SpO2, systemic blood pressure, arterial carbon dioxide level, hematocrit level, and cerebral blood level. However, since the evaluation was made between two consecutive measurements, it is also stated that the effect of these factors is limited. Following the placement of the carotid cross-clamping, it was noted that the increase in blood pressure following the fall in NIRS value was not sufficient for cerebral protection. Even Giustiniano et al. showed a poor correlation between blood pressure and NIRS values. In our study, we observed that NIRS and MAP values were independent of each other in patients who placed shunt. In some patients, there was a slight decrease in MAP value when the NIRS values fell further, but in some patients, MAP values were found to rise, on the contrary. Postoperative neurological complication (right hemiparesis) was observed in only 1 of 68 patients who underwent elective CAE operation in this study. During the operation, it was observed that the patient's NIRS values were normal, and the root pressures were above 40 mmHg during the cross-clamping period. Therefore, it was determined that there was no need to place the intraluminal shunt in the patient. It was concluded that this neurological complication may have developed due to plaque embolism. Cerebral monitoring in elective CAE operations has great importance in determining the necessity of using intraluminal shunt to reduce the complications that may occur. Near-infrared spectrometry is a monitorization method that should be routinely used for the reason that the use is easy and easy to interpret. However, we believe that the combined use of stump pressure measurement allows more effective results. Pennekamp CW, Immink RV, den Ruijter HM, Kappelle LJ, Bots ML, Buhre WF, et al. Near-infrared spectroscopy to indicate selective shunt use during carotid endarterectomy. Eur J Vasc Endovasc Surg 2013;46:397-403. Radak D, Sotirovic V, Obradovic M, Isenovic ER. Practical use of near-infrared spectroscopy in carotid surgery. Angiology 2014;65:769-72. Ghosh A, Elwell C, Smith M. Review article: Cerebral near-infrared spectroscopy in adults: A work in progress. Anesth Analg 2012;115:1373-83. Findlay JM, Kesarwani R, Jacka M, Marchak BE. Combined stump pressure and oximetry for shunt use during carotid endarterectomy. Can J Neurol Sci 2017;44:692-6. Jonsson M, Lindström D, Wanhainen A, Djavani Gidlund K, Gillgren P. Near infrared spectroscopy as a predictor for shunt requirement during carotid endarterectomy. Eur J Vasc Endovasc Surg 2017;53:783-91. Ali AM, Green D, Zayed H, Halawa M, El-Sakka K, Rashid HI, et al. Cerebral monitoring in patients undergoing carotid endarterectomy using a triple assessment technique. Interact Cardiovasc Thorac Surg 2011;12:454-7. Hans SS, Jareunpoon O. Prospective evaluation of electroencephalography, carotid artery stump pressure, and neurologic changes during 314 consecutive carotid endarterectomies performed in awake patients. J Vasc Surg 2007;45:511-5. Stilo F, Spinelli F, Martelli E, Pipitó N, Barillà D, De Caridi G, et al. The sensibility and specificity of cerebral oximetry, measured by INVOS – 4100, in patients undergoing carotid endarterectomy compared with awake testing. Minerva Anestesiol 2012;78:1126-35. Highton D, Elwell C, Smith M. Noninvasive cerebral oximetry: Is there light at the end of the tunnel? Curr Opin Anaesthesiol 2010;23:576-81. Giustiniano E, Alfano A, Battistini GM, Gavazzeni V, Spoto MR, Cancellieri F, et al. Cerebral oximetry during carotid clamping: Is blood pressure raising necessary? J Cardiovasc Med (Hagerstown) 2010;11:522-8.